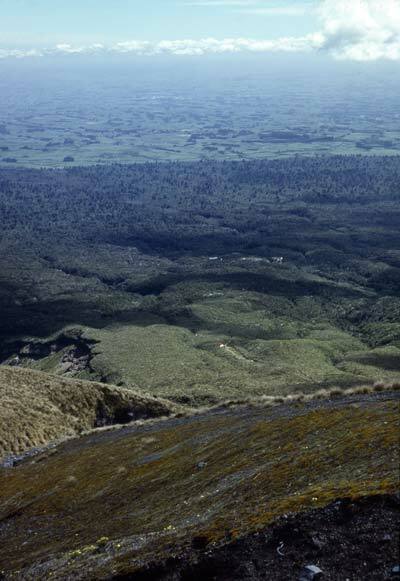 This view looking down Mt Taranaki shows the vegetation zones. In the foreground is alpine herbfield and mossland, which extends down to about 1,500 metres altitude. Below this is red tussock grassland (left), which descends to about 1,250 metres where it gives way to alpine shrubland (light green, centre). Dark green forest grows below the alpine shrub zone. At one time forest would have extended out onto the low country that surrounds the mountain, but much of this land has been cleared and converted to pasture.